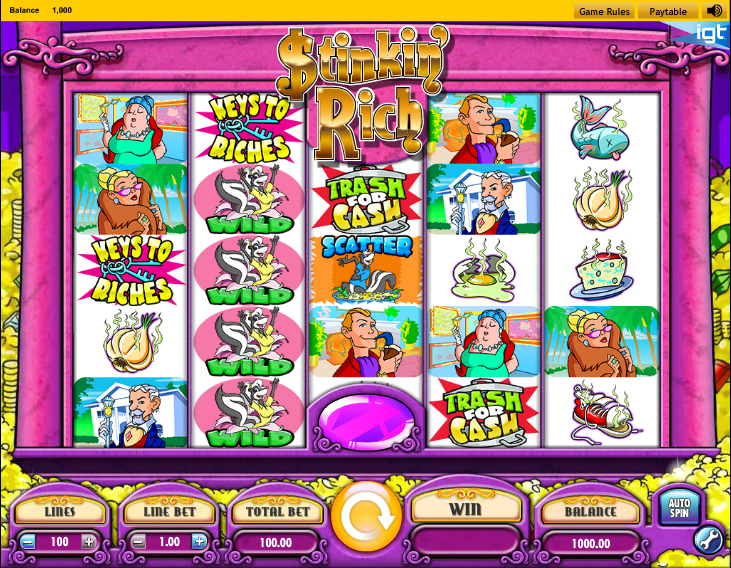 It's time to get down and dirty with the Stinkin Rich free slots game! 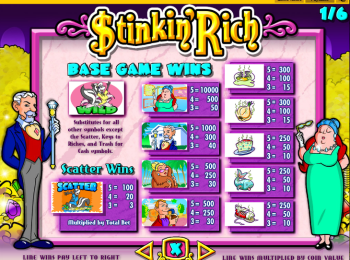 The infamous Stinkin Rich slot features a clever cartoon audio track and equally fun graphics to keep the entertainment level maxed. The game features 5 reels and 100-paylines making it a 'can't-miss' slot at Slotorama. 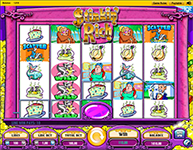 It’s time to get down and dirty with the Stinkin Rich free slots game! 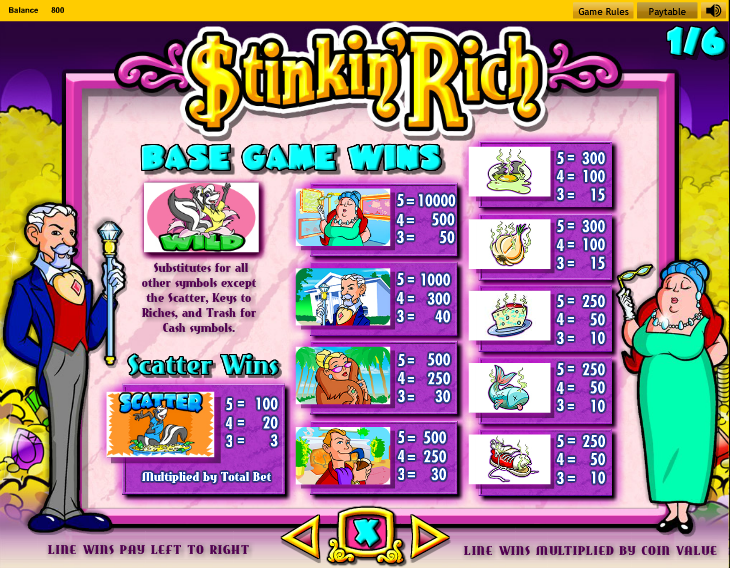 The infamous Stinkin Rich slot features a clever cartoon audio track and equally fun graphics to keep the entertainment level maxed. The game features 5 reels and 100-paylines making it a ‘can’t-miss’ slot at Slotorama. 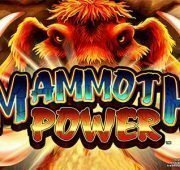 With so many paylines, the chances of winning a large amount on this slot are ramped up. The stinky Skunk character is on your side as you try to pry some of the riches away from the wealthy patriarchs. The game symbols include the skunk, garlic, a rotten egg, a rabbit, a rancid old fish, cheese and smelly shoes. The game also features a rich family that includes the old man, an old lady in a fur coat, and their two spoiled kids. Stinkin Rich has been a hit slot for IGT for years and it’s due largely to the amount of fantastic bonus features in the slot. 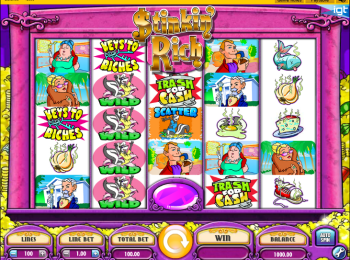 Stinkin Rich has two bonus features – one is the Trash for Cash bonus and the other is the Keys to Riches bonus, both of which have been rewarding players online and in land-based casinos for years. Trash for Cash is a multiplier bonus that is triggered when the “trash for cash” symbol appears anywhere on the 3rd, 4th and 5th reels. The multiplier, which can be between 2 and 5, is decided by the trash can chosen by the players. The numbers beneath all the other trash cans are also displayed, added up and the sum is multiplied by the number behind your selected trash can. 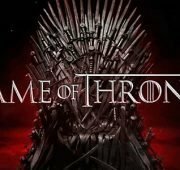 The final figure will be your multiplier, which means that the payouts will be ranging between 6 and 40 times your wager. 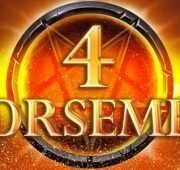 The Keys to Riches is a free spins bonus, which is triggered when at least 3 “Keys to Riches” symbols appear on a wagered line. Initially, you get 5 free spins for each of the lines that have the bonus symbol. The reels spin automatically during the feature and you can win more free spins during the first five free spins. You can get a maximum of 325 free spins in a go. 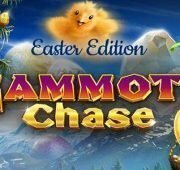 The more your free spins, the better your chances of winning more credits.